Lavanda Eau de Cologne - This fresh Eau de Cologne is a blend of wonderful fresh citrus, lavender and wood scents. Comes with a screw lid and without a vaporizer to keep up with the traditional look. The wonderful blend of fresh citrus and lavender notes is legendary. Despite the modern times, it's production is still made in the traditional manner. Can be mixed with a tiny bit of 444 Aftershave Gel for a superb fresh sensation. This Mediterranean lavender scented cologne is an absolute classic from Ach Brito. Use it ideally as a wonderful cologne or relaxing aftershave or even for perfumed laundry. Tip: Place a small cloth with a few drops of this Lavender Cologne inside your wardrobe or in drawers to get a soft scent in your clothing. 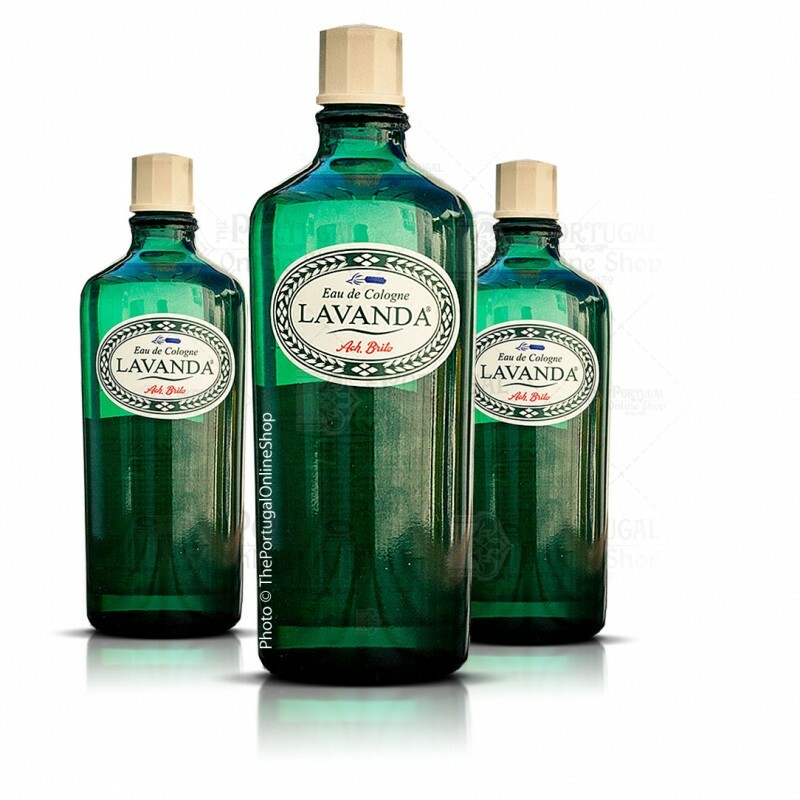 For several generations the Lavender Water Cologne perfumes the Portuguese. With a fresh lavender and incredibly exciting, this absolute classic fragrance Portuguese colony was the first of many, with the uniqueness of captivating both sexes. There are even those who have discovered her peculiar uses: try few drops in the water tank of your steam iron for household linen deliciously scented. General opinion: The first thing that caught my attention was the presentation of the bottle (slightly truncated cone) built in a green glass, but with a natural blue tint (as a mixture of cobalt). It's not far from the typical green color of the wine bottles that are used on a daily basis. The finished glass is not perfect such those smooth modern bottles,but presents a series of undulations that give it a very traditional look. If to this we add the label design (front and back), and its characteristic bakelite cap, all this takes us to that "stale" air typical of the products manufactured in the 50s. Scent and other notes: As for the aromatic characteristics, is not the typical colony of Lavender we might expect. Smooth citrus exit notes envelop the powerful Lavender, later giving way to middle notes more "gourmand" which highlights spicy clove. The closed heart is a scent of lavender with a woody package, I would say cedar. Projection isn't perhaps the same strength of other colonies of this kind, but the trail is so nice and although it does not "fill" the environment, it certainly leaves a remarkable trace. In durability (fixation) I can not consider bad at all. It will remain active throughout the whole day, including in the next one. In terms of gender allocation, see more typical for male use, especially for those "closed" and woody notes seen in heart. Nice and fresh. Very good Balance between fresh ans bloomy, Lavendel ans orange.